The discovery of this article in an Arkansas newspaper is an object lesson in widening your search strategies. The subject of this article is my great grandfather, Joseph Hanson Mayne who was born in Frederick County, Maryland but lived most of his life working as a United Brethren pastor in the vicinity of Cincinnati, Dayton and Columbus, Ohio. His son, Virgil B. Mayne was also a pastor and served for a while at the Congregational church in Gentry, Arkansas. If I had limited my search to Ohio, I might never have found this article. It was common for newspaper editors to search for articles from other newspapers to fill their pages. The Journal-Advance editor had the added bonus here that the story was connected to a local man of note. The arrival of the new Congregational minister was trumpeted in this depression era newspaper. The Rev. 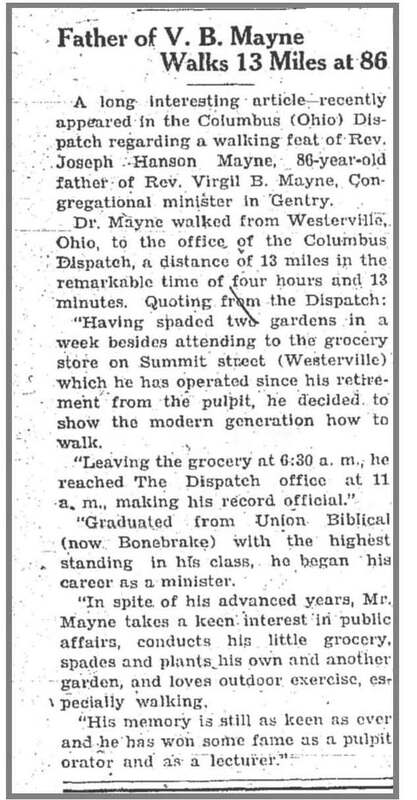 Joseph Hanson Mayne, Saturday morning established a new all-time, All-American record for retired ministers, 86 years old and upward, by walking 13 miles from Westerville to the Dispatch office, in the remarkable time of four hours, 30 minutes. Dr. Mayne set out to establish the record for which Dr. George Scott, professor emeritus of Otterbein college, essayed to make at the same age. Dr. Scott failed in his attempt because before he reached Alum creek a large and ferocious dog ripped the seat from his pants and stopped the adventure. The Rev. Mr. Mayne escaped such a fate, and by firmly refusing the offers of a dozen or more motorists who mistook him for a hitch-hiker, reached his destination and delivered this account to the city editor of the Dispatch without mishap. Dr. Mayne preached the sermon at the United Brethren church in Westerville Sunday. Having spaded two gardens in a week besides attending to the grocery store on Summit street which he has operated since his retirement from the pulpit, he decided to show the modern generation how to walk. Leaving the grocery at 6:30 a.m., he reached The Dispatch office at 11 a.m., making his record official. Dr. Mayne retired, after half a century in the ministry, having presided at a dozen churches from Newport, Ky., to northern Ohio. He preached in many churches in and around Dayton, was a student at Heidelberg college, and a graduate of Bonebrake. He was born on a farm near Frederick, Md., and was one of 11 children. His boyhood was spent on the farm at the peak of excitement over slavery. He was a young man when the war between the states came, and the farm near Frederick seemed the center of that war, three great battles, Gettysburg, Antietam and Monocracy (sic). For two days, he remembers, he with brothers and sisters listened anxiously while the roar of cannon shook the air and earth at Gettysburg. He came to Ohio when he was 17 years old. A friend from his own section of Maryland, had promised to get him a job in the quarries at Marietta, where he was employed. Reaching Marietta he could not find a trace of his friend or a trace of a job, so he decided to push farther west. He had an uncle, bearing the same name as his own, living near Dayton, and he started there. When he reached the crossing of the Little Miami railroad near Lebanon his money was exhausted, and he commenced, without realizing it, training for Saturday's walk. He walked to Dayton and started in a general direction toward his uncle's farm. He was plodding along the dirt road when he met a road wagon, upon the seat of which a man was sitting. The man shouted: Whoa! Are you a Mayne? You walk like a Mayne. It was his uncle. He went to the uncle's farm, but soon found a job with a neighboring farmer and went to work. Always studious and inclined to religion he attended Heidelberg college, then taught school and studied for the ministry. Graduated from Union Biblical (now Bonebrake) with the highest standing in his class, he began his career as a minister. In spite of his advanced years, Mr. Mayne takes a keen interest in public affairs, conducts his little grocery, spades and plants his own and another garden, and loves outdoor exercise, especially walking. His memory is still keen as ever and he has won some fame as a pulpit orator and and as a lecturer.